With summer well on its way and lots of sunshine in our forecast, many – myself included – are excited to welcome another patio season. Somehow cold drinks are just a bit more refreshing when enjoyed under the sun or with stars up above. The Fairmont Empress in Victoria features a stunning veranda, located directly below the iconic Empress sign, with sweeping views over the harbour. Recently re-opened in early May, visitors can enjoy a taste of summer from the best seat in the house. In 2011, the Fairmont Empress became the latest property in the Fairmont family to welcome resident honeybees – something our Island is always in desperate need of. With 10 hives and 800,000 honeybees, the Fairmont Empress has since produced 1,300 pounds of honey. New for the 2012 summer season, the Fairmont Empress has teamed up with Hoyne Brewery to create a signature beer, known simply as the Empress Honey Wheat Ale. While you can enjoy one of these sweet brews on the Empress’ Veranda, the Veranda also offers an intriguing farm-to-fork menu featuring some of Vancouver Island’s most unique ingredients. The Fairmont Empress’ Veranda is open from 11:30 a.m. to dusk. The Veranda also provides heaters, wraps and sun shades for guests’ enjoyment. For more information on The Fairmont Empress and Veranda dining, visit them online. 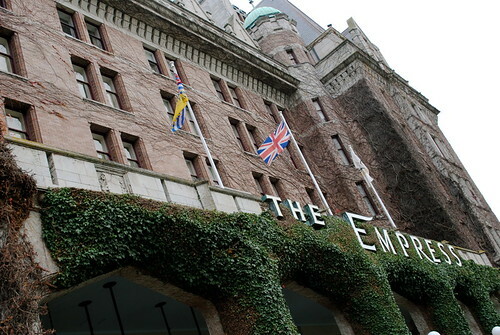 The Fairmont Empress Hotel is located at 721 Government Street, Victoria, BC.